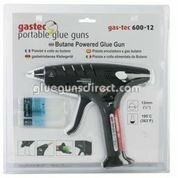 Gas-Tec 600 powerful, robust, compact portable glue gun that runs on butane gas, sold throughout the UK & Europe. The Gas-Tec 600 has been a very popular replacement for the now obsolete Gas-Tec 100, Gas-Tec 300 and Gas-Tec 500 models. 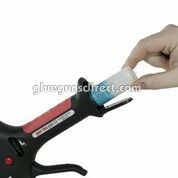 One question that keeps being asked “ how do I fill the gun with gas?” We have set out to answer this question and add a few more points that may help you get the best out of your Gas-Tec 600 glue gun. 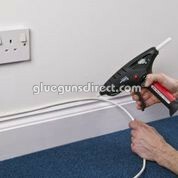 The first thing you will notice on receipt of your new Gas-Tec 600 is that it is built to a very high standard, as gas glue guns go this is the premium tool available on the market. 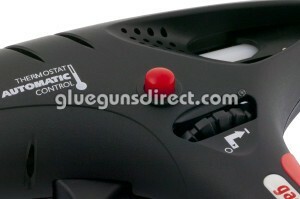 Also worth noting is the soft-feel handle and full-hand trigger which makes this model very comfortable to use. A lot of thought has gone into the design of this glue gun, we have taken the previous obsolete models ideals and built a superior tool offering many more advantages. The Gas-Tec 600 comes with two cartridges (Blue), these are the Tec Lec gas refill cartridges that require filling with standard cigarette lighter butane gas. This should take no more than 15 seconds ! Only use quality gas !! Once filled, insert one cartridge into the handle of the glue gun. This cartridge of gas will keep your Gas-Tec 600 running for approx. 90 minutes. When empty simply refill with butane gas and insert back in tool. These cartridges are reusable, please do not throw the cartridges away! 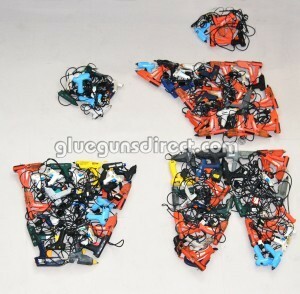 Replacement or extra cartridges are available for lost or on-site work when a quick change over is required. 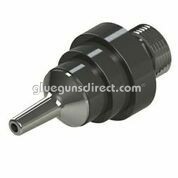 Gas-Tec 600 piezo ignition system allows easy start up. Simply insert your Tecbond glue stick into the feed chamber and turn the gas dial (wheel) to on and press the red ignition button. Full working operational temperature in reached within 5 minutes, please wait until this tool has reach temperature, do not try and force the glue through! 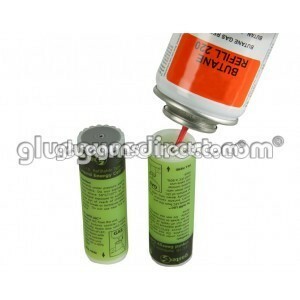 When working temperature has been reached the Gas-Tec 600 can deliver an impressive 1.5 kilos of molten adhesive on demand depending on the glue formulation and is thermostatically controlled to maintain the optimum working temperature to achieve the best glue delivery and the highest bond strength. When finished turn the gas dial (wheel) to off. 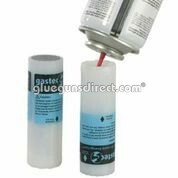 Never withdraw a part melted glue stick from the chamber or glue feed, this may seriously damage your glue gun! It’s worth noting that although the Gas-Tec 600 is a powerful tool when compared to other gas tools available, if you have a demanding application needing glue fast, then you need to look at our range of Electric industrial tools with outputs ranging from 2 kilos – 5 kilos per hour of molten adhesive! The Gas-Tec 600 is designed to work with TECBOND glue sticks and when used as a system is covered by a 12 month manufacturer’s warranty. 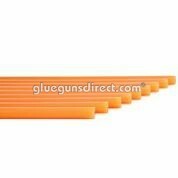 When using competitors glue sticks with this tool, there is always a risk of “glue melt back” or “glue back up” from these glue sticks often due to their diameter falling below the recommended size for the Tec glue gun or the resins used in their manufacture which may require the tool to run at lower temperatures to prevent dripping. For optimum performance from your Gas-Tec 600, use Tecbond 12mm glue sticks! Gas tools are not as powerful as the Tec electric glue guns, however they are very useful for on-site work when no mains power is available ranging from: shop fitting, exhibition displays, flooring & carpet fitting, ceramic tile display boards, low voltage wiring, paintless dent removal (PDR) and many more applications. Have an old Gas-Tec 100, 300 or 500? Don’t throw it away, exchange it for a new Gas-Tec 600 with our new for old scheme! If you need any further assistance with your Gas-Tec 600 please call 0161 627 1001 and our friendly sales team will be pleased to help.